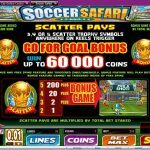 Soccer Safari is a Microgaming slot dedicated to the most popular sport in the world, soccer. This game is played all around the world, even by the wild animals in Africa. The game has an attractive set of symbols and an overall fun vibe. Even though this is an older slot the animations and symbol details are still decent giving it an attractive look. Beside the popular theme Soccer Safari also has a big number of bonus features. They contribute to a more attractive game play and can produce great payouts as well. The Soccer Safari Logo is the wild symbol in the game. He comes with a maximum 2.000 coins payout and will substitute for all of the symbols except the scatters. This slot has two scatter symbols. The first is the Golden Ball, which triggers the Go For Goal Bonus if 3, 4 or 5 of them land anywhere on the reels. In this game you can win up to 60.000 coins. First you choose one of three teams, then one of five players and at last you try to score a goal. 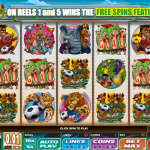 The slot also has a free spins bonus game. In order to trigger it you will need to land a Zebra symbol on reels 1 and 5. Once this happens the Zebras will expand to cover the entire reel and will serve as extra wild symbols. They will be locked in place while the three central reels re-spin 5 times. On the last spin the three central reels will be locked and reels 1 and 5 will re-spin once. If the Zebra symbol lands on reels 1 and 5 again the feature is re-triggered. 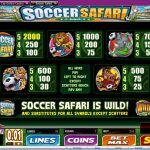 Soccer Safari is a great slot which is sure to attract all soccer fans. The game play is fast and exciting and players can score big payouts thanks to the great bonus features which this Microgaming slot has to offer. If you prefer something more dark and mysterious try playing Skull Duggery a 5 reel slot by MicroGaming.